Giant swallowtail butterflies have a wingspan of 4 to 5 inches. The top side of the butterfly’s wings is dark brown-black with bands of yellow spots. Have you seen a giant swallowtail butterfly in Westborough? Spotted in town last summer, the lovely giant swallowtail (Papilio cresphontes) is newcomer to Massachusetts from states farther south. The big question is: Will one show up in town again this year? Keep an eye on local butterfly bushes (buddleia) as they bloom in July and August. Found year-round in Florida, giant swallowtails are common in the southeastern U.S., but they’re rare northward. In recent years, they have appeared in western Massachusetts and have started breeding there. 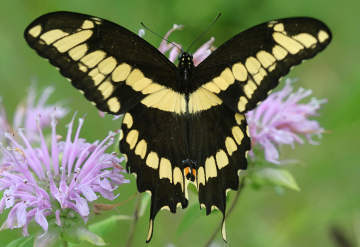 Last summer giant swallowtails were also seen in central and eastern Massachusetts. With a wingspan of 4-5 inches, giant swallowtails are likely to catch your eye. The top side of their wings, which we see when the wings are spread open, is dark brown-black with bands of yellow spots. In contrast, the underside of their wings, which we see when the wings are closed, is mostly cream colored. They take nectar at wild plants that typically attract butterflies, such as milkweed, thistles, and wild bergamot, in addition to the popular butterfly bushes in gardens and yards. While sipping nectar, giant swallowtails often flutter their wings to balance themselves at a flower, instead landing and sitting still. The underside of a giant swallowtail’s wings is mostly cream-colored. While sipping nectar, these quite large butterflies often beat their wings to balance themselves at a flower, rather than landing and sitting still. Where did Westborough’s giant swallowtail come from last year? It may have migrated north, perhaps from Connecticut. Or it may have traveled eastward from western Massachusetts where giant swallowtails have recently started to breed. Like other butterflies, a giant swallowtail goes through four life stages: egg, caterpillar-like larva, pupa (inside a chrysalis where it transforms into a butterfly), and adult butterfly. Giant swallowtail caterpillars feed on plants in the rue or citrus family (Rutaceae). In southern states, that often means orange trees, and they can be a pest there. Farther north, where citrus crops don’t grow, the usual caterpillar food plant is northern prickly ash (Zanthoxylum americanum). This small, shrub-like tree (not really an ash) is native to parts of Massachusetts as well as parts of neighboring New York and Connecticut. How do giant swallowtails survive our New England winters? They typically pass the winter in a dormant state in the pupa stage inside a chrysalis, much as swallowtails such as our common native tiger swallowtails do. Reports from western Massachusetts are that some giant swallowtails emerged there this spring, so at least a few got through the hard winter we had. According to the authors of the study, their results “suggest that a major, climate-induced shift of North American butterflies, characterized by northward expansions of warm-adapted [species] and retreat of cold-adapted species, is underway.” The authors estimated population trends for nearly all butterfly species in Massachusetts (100 of 116 species), based on 19 years of data collected by the Massachusetts Butterfly Club (http://www.naba.org/chapters/nabambc/). 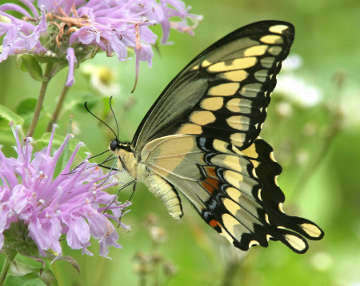 Giant swallowtails were hot news last summer because of their likely connection to climate change in Massachusetts. They were a prime example of butterflies that can serve as "canaries in the coal mine" by providing warnings that climate change may be taking place. More giant swallowtails in Massachusetts may mean a warming climate. If you spot a giant swallowtail in town this summer, let us know. Send an email to the Westborough Community Land Trust’s wildlife sightings page (sightings@westboroughlandtrust.org).